As a network marketer, it is very essential for you to keep your flow of transactions in control, but that kind of control takes a toll on you, especially if you make a lot of payments. 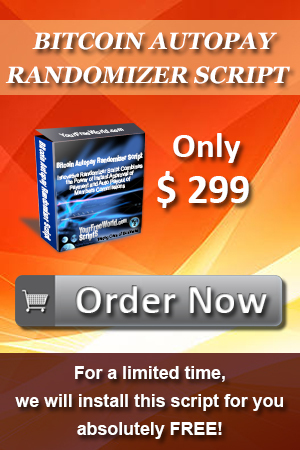 With Bitcoin Autopay Randomizer Script, you just have to pay one-time and the super intuitive algorithm of our script will do the rest. In simple terms, you make one payment and it splits to admin, sponsor and members autonomously. This unique automated script is perfect to save lots of your time and it's specifically developed to resolve your transaction problems. 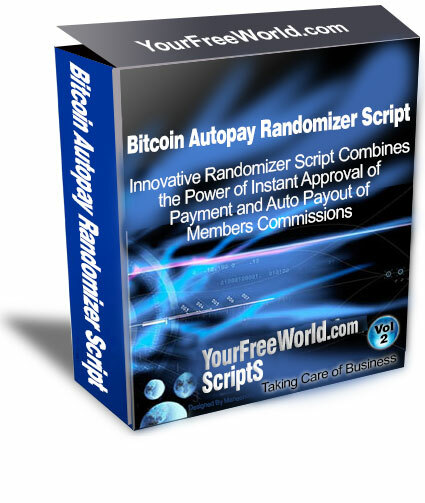 Similar to Bitcoin Autopay Randomizer Script, the Bitcoin Autopay Randomizer Script is packed with powerful and effective features. NOTE : All these features are for admins. So, what's the wait? Buy the script right now, and experience the most convenient way to pay fees, commissions and bonuses to the suitable people ‒ automatically. The features of this script are the best-in-class where some of those are described henceforth. Let's have a look. Customizable with easy-to-follow setup instructions. Offers the feasibility to set up 4 admin fee with 4 different bitcoin wallet address. Supports unlimited payment levels with the default setup of bitcoin wallet address through the admin in case the sponsor or upline is not present at that level. Bitcoin Auto Approval Process to enable auto verification of all payments. Enables control over all the approved member payments and delete payment function as per feasibility. Comes with easy-to-follow instructions for the Admin control panel, so you can setup your program without a hitch. Choose the particular fields you want to display in the signup form. Set the YourFreeWorld.com Scripts Affiliate ID to earn commissions from script sales from your ID. Choose the number of banners to display at the bottom of each page. Choose whether to send confirmation and referral notification emails. Add the HTML code for the member's bonuses page. Edit Your Pages by placing the HTML code into the system for the FAQ, Home, Logout, Member's Area Home and Terms pages. Setup the number of bonus banner ad credits a member receives on upgrading account. Add the HTML code for the bonus download for Free and upgraded members. View/Edit/Delete all existing members, free members only, pro members only or pending members. Search member function with name, username or email address. Email all members in HTML or text format, and include up to eight special form tags. View pending member payments including the transaction ID number, from username, to username, payment details, amount, transaction date, and approve or delete payment function. View all the approved member payments with the above details, and delete payment function. Add/Delete promotional solo ads and banners for your members to use to attract new members. View pending and approved testimonials, with approve or remove functionality. - Approved/Pending testimonials, payments, banners, promo banners/solo ads. You are not allowed it to use it at more than 1 domain or sell / lease this script in any form.